Kick up the flavor gage for this honey topping by using toasted nuts! Makes a super easy homemade gift that's sure to be appreciated. 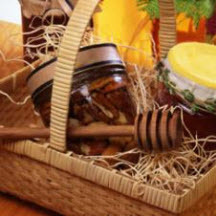 Layer one type of nut in sterilized jar and cover with a layer of honey. Repeat layers twice. Tightly close jar with lid. Makes 1/2 pint (1 cup). *Use any combination of nuts to equal 1/3 cup.